Sorry, I've been trying hard to be less negative but this blizzard was infuriating. If you've been around for awhile, you know I always speak highly of strawberry blizzards. There's a great magic that happens when they mix their strawberry topping with their vanilla soft serve, but that magic didn't happen today. I can only assume that the machine was out of whack and there was way too much air overrun in the product tonight. Every bite tasted like (highly whipped) whipped cream, there was just no heft to it. This was supposed to be my dinner and instead it felt like eating air. The worst part was that I was hungry and I would have a couple bites and go "oh this is terrible". Then a few minutes later I would think "but I love strawberry blizzards" and take a few more bites. This went on for about twenty minutes, but in the end, I did not finish my blizzard. Now I know these stories don't really help you. 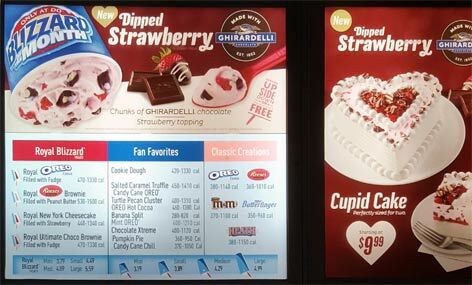 Most likely you will get a respectable strawberry blizzard with a bunch of chunks in it... that is unless DQ has changed their soft serve formula, but that seems unlikely right? RIGHT??? Nah, that would be crazy! 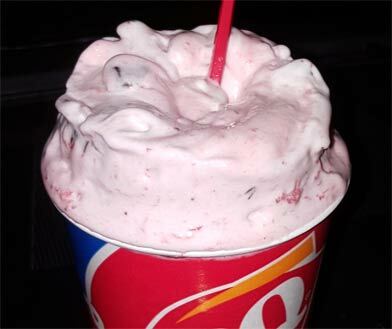 Anyway, yeah, strawberry blizzard with lots of chunks. I can't say the Ghirardelli factor was huge. I did seem to get larger chunks some times, but for the most part I was too busy worried about the texture to focus on sorting the bits. Hope you have better luck than I did. Wait! Wait! Wait! Stop the presses! I can at least clear up one confusion before the day is done. 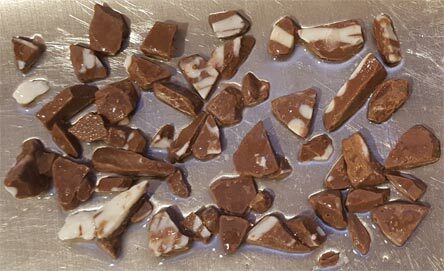 It's not clear what "Ghirardelli chunks" really means so here is your answer. I was serious about not finishing this blizzard which meant I never dug through everything that fell to the bottom, which as you can see, was quite a bit of chocolate. I guess because the soft serve was so light that it had trouble suspending these fairly large bits. I should have thrown a penny in there for comparison! On Second Scoop - Circa 2018: I decided to try this again, hoping the first time was a fluke, but you know what? I still got that weird airy texture that I got in 2017. It's like the mixed the blizzard with strawberry whipped cream instead of their tasty strawberry sauce topping. I don't know what's going on, but I would avoid this one. I hear lots of stories of botched blizzards, people say something was made with too much/too little X or that the wrong ingredients were used or the server just made it wrong--but I hear it so frequently that inconsistency seems to be the rule rather than the exception, probably because there isn't much training given to the staff- who usually are part time placements for teens who don't stay long. And this is just based on other people's reports, here in NYC there aren't many DQs(i think there might be 1) so I've never even seen one in real life. Yeah, I think anyone that goes a decent amount knows to expect.... imperfection shall we say. There is some personal bias in there (person X prefers more of ingredient Y), and usually a blizzard is good enough, but yeah, there is no reason for stuff like this. My children and I used a BOGO coupon last weekend to try this blizzard. At least you got Ghirardelli chunks. I think we just got the old choco chunks they used previously before reformulating it for this year. Our chunks looked NOTHING like that. I don't think they were Ghirardelli. Again, I think you are correct, and it boils down to training. It seems many of the workers don't even know what goes into the blizzard. This also happened to me a few times at Baskin Robbins. I ordered the cookie ice cream sandwich, and the workers had no idea how to assemble it. They did not realize the final product should be rolled in sprinkles like pictured. Too often I am disappointed by products that can not be carried off as advertised. I am better left to just make my own at home sadly.